The Paint Spy Accident Detector is a high quality, precision-built tool that quickly reveals hidden body damage, repaint or rust repair. Used by automotive professionals, its Neodymium Magnetic Technology senses the thickness of car paint and tells you within minutes if you should buy the car or walk away. A previous accident is the single most important thing to avoid when buying a used car. Most people think that a history report (like Carfax and AutoCheck) will give them proof of an accident. However the National Traffic and Safety Administration estimates that over 10 million car accidents go unreported per year and most of those do not show up on a history report. That means there are many cars being sold with a clean history report that actually have been in an accident, sometimes serious. You cannot trust a car sales person at a dealership or a private seller to tell you if the car has been previously repaired. The Paint Spy gives you the truth, the whole truth and nothing but the truth. 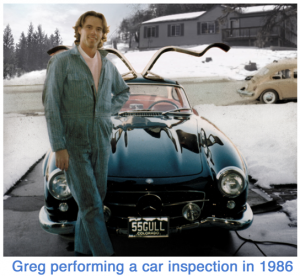 The Paint Spy was invented by Car Buying Specialist Greg Macke (Your Car Angel) who saw the need for an inexpensive tool that anyone could use to inspect a car for hidden body damage. Greg has been helping people buy cars since 1986 when he was the National Car Buyer for Beverly Hills Sports Cars. He is also the lead creator of CarBuyingSupport.com, a website dedicated to helping consumers with their car purchases. His knowledge of inspecting cars for hidden accidents led him to develop the Paint Spy Accident Detector.